Hank has prepared some heavy artillery for you. As a member of The Bomb Squad, Hank Shocklee helped to produce a selection of seminal Public Enemy records. He's also been responsible for film soundtracks and set up his own production company. 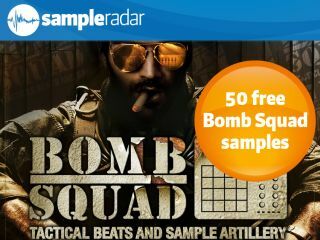 A new Bomb Squad album is on the way in the Autumn, but prior to that, Hank has created a new 1GB sample collection - Bomb Quad - Tactical Beats and Sample Artillery - for Loopmasters. You can buy this now for £34.95 from the MusicRadar sample store, but as a taster, we've got 50 samples that you can have for free. To read Hank's thoughts on the past, present and future of sampling, and to learn a few step-by-step sampling techniques direct from the man himself, check out the brand new Computer Music Sampling Special (CMS48), which is available now. The samples are split into two folders: loops, and sounds and FX. The Bomb Squad samples are supplied in a zip file, so you'll need to extract them before you can see them. Enjoy!